iConnect is more than just CRM (customer relationship management). We call it information management because all relevant information about your relations and your own company or organization is accessible through iConnect : attentions, appointments, emails, knowledge, documents, financial data and much more. Information management is also the key to commercial success and customer satisfaction. But also to good relations between your organization and your relationships in general. Nobody can overlook relevant information anymore. Unlike other software, all information in iConnect can be searched and viewed from different points of view. Here you register all address- and company data of your relations. The company data are mainly registered in profiles, on which you can easily make selections, to handle your marketing efficiently. In one of the tabs you can register (telephone)?notes on the relation. New documents (Word, Outlook etc.) can be initialised using templates, saved and overviewed from a relation. Existing documents can be added to the listing. Graphs can be shown in the screen. All files can be shown in the relating software. 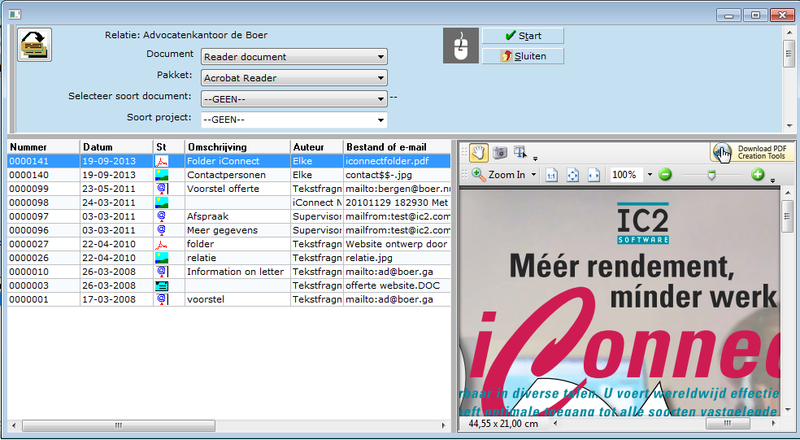 Documents can be scanned from iConnect and added to relations or sent as attachments with e-mails. Tasks are planned, assigned to persons and transported to the hour registration after completion. If desired, the task is shown in a ?To Do? list on starting the program. Also the priority can be assigned by dragging the tasks. Appointments and to do points can be shown in an agenda. Based on the planning the time of a meeting can be automatically chosen, so that more participants are available during the expected period of the meeting. In iConnect the registration of hours can easily be maintained per employee of the company. The hours are added per day or per period to projects. Extra notes can be added to registered hours. Hourly rates can be recorded per project and per employee. An invoice can directly be made from hoursregistration module or the projectmodule for fixed amounts. With the module for invoicing you can easily create invoices based on e.g. hours, in several currencies. Full support for electronic invoicing. Process and journalise sales and purchase invoices. Run reports via Excel to create extra overviews. iConnect is user friendly multilingual (English, Dutch, German, French, Spanish) CRM/ERP software. There is very much information directly accessible from the central customer data, including documents, financial data, route planning, Google Earth, website. User has much influence on new functionality. Ask for leaflet or demo.